ZOOM! Professional Teeth Whitening backed by clinical evidence of more than 20 years. Whilst individual results will vary Philips Zoom WhiteSpeed can whiten teeth up to 8 shades lighter in one appointment. Please take a moment to read about our comprehensive ZOOM Package. Red wine and coffee is something you do not want to give up but you would like help and advice on attaining and maintaining a brighter smile. ZOOM! Professional Teeth Whitening can give that boost to your confidence when you smile. A General Dental Examination, with the suitability of tooth whitening assessed. Free DayWhite syringe at every hygiene appointment (or other whitening product suited to your needs). We recommend that you have a check-up every 6 months or as directed. At every check-up, you will receive free a syringe of DayWhite Gel to maintain your white smile. Our whitening package is safe and convenient. We would never promote or sell you a service that isn’t safe. Both your dental health and cosmetic dental needs are examined and discussed with you. We encourage you to discuss any sensitivity issues you may have throughout this process as there are products that will help relieve symptoms for you. Generally, health funds do not cover cosmetic procedures. Although recently we have noticed that some funds do. The item numbers are: 118 (bleaching external per tooth) x 16 (16 equals number of teeth bleached). The item numbers for the home maintenance kit are 926 x 2 and 119 x 2. You will also be able to claim on the examination and scale and clean component of our ZOOM Package. The item numbers are 011 or 012 & 114. Please note unlike other packages out there we do not only conduct a whitening consultation, a full examination is done at your initial appointment. 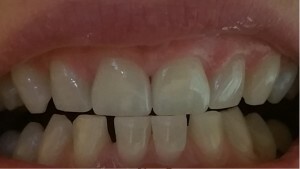 We also do a full mouth scale and clean on all teeth, including the ones at the back as well as a removal of stain. We can claim for you on the day of treatment using HICAPS, and you just pay the gap.